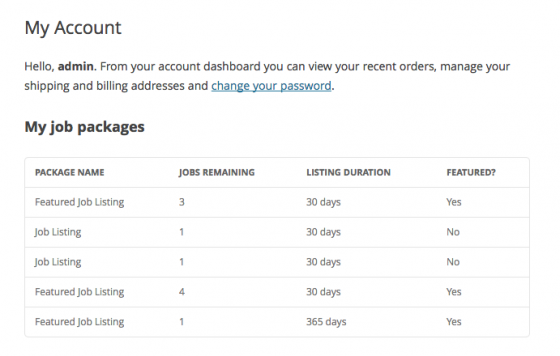 Integrate WP Job Manager with WooCommerce to add paid listing functionality. Sell Job Packages (a new product type) either in your store or as part of the job submission process. 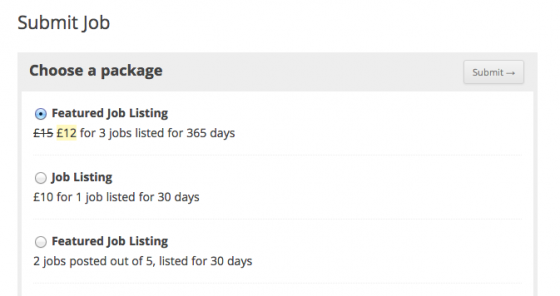 Job Packages can be given pricing just like regular products, and can be customised to allow users to submit multiple job listings with a single pack, create featured listings, and create listings with varying expirations. You can even offer several packs and pricing options at once – all jobs packs will be visible during the job submission process. Purchasing job packs forces checkout during registration so that they are associated with the user’s account. Purchased job packs are then displayed on their account page.